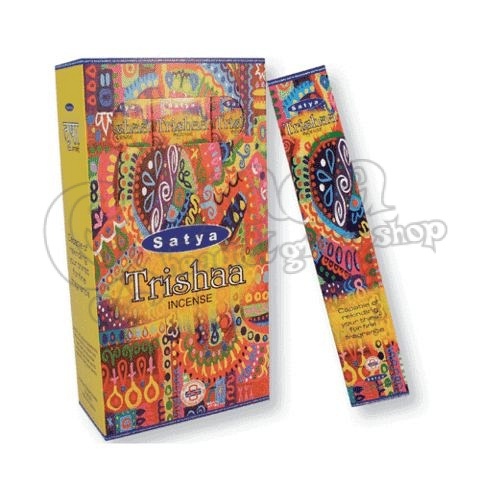 Satya Trishaa Stick Incense is part of the Satya Oriental Series. Blessing is a powdery, soft, sweet and bright aroma. Made by Shrinivas Sugandhalaya, Satya Blessing is a Masala Incense. Masala incense is made in a method which uses natural resins and a complex combination of oils and herbs that are combined together to form a dough-like mixture. This mixture is then rolled on to bamboo sticks. The result is a far superior incense as compared to other sticks which are just dipped in perfume oils. Each box is 15 grams, or approximately 12 sticks, and comes in an eco friendly pack.